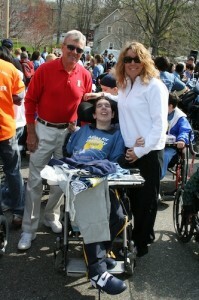 Andy Lash with his father Fred and sister Morgan at Miles for Matheny 2009. Two of the top fundraisers for Miles for Matheny will be interviewed on local CBS stations this week. 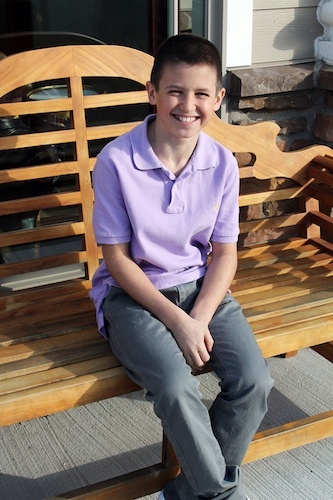 Justin and Morgan Lash, brother and sister of Matheny adult patient Andy Lash, will be guests on the CBS 2 morning news this Saturday, April 20, between 9 and 10 a.m. Andy “Flash” Lash, the fundraising team created by the Lash family, as of April 17, had raised $3,695. Jack Levinston, a 12-year-old from Bridgewater, NJ, who is running the 5K and raising money for Miles as his bar mitzvah project, has been interviewed by WCBS Newsradio 880 anchor Wayne Cabot. That interview will probably air on 880AM on Thursday, April 18, although it could also air on April 19 or 20. Jack’s latest fundraising tally is $2,240. Miles for Matheny is being held this Sunday, April 21, at Liberty Park in Peapack, NJ. Activities at Miles, in addition to the 5K, include the Lu Huggins Wheelchair Walk, five different cycling routes, a Kids Fun Run and The Friends of Matheny’s “Breakfast of Champions”, plus luncheon refreshments in the park. All funds raised help support the Matheny Center of Medicine and Dentistry, which provides medical, dental and therapy care to people with disabilities in communities throughout New Jersey. WCBS-TV and WCBS Newsradio 880 are media sponsors of the event. Other major sponsors include: the Poses Family Foundation, title sponsor; Partlow Insurance Agency; Peapack-Gladstone Bank; Porzio Bromberg & Newman P.C. ; and Affinity Federal Credit Union. On-site registration begins at 8:30 a.m., Sunday in Liberty Park. For more information, call (908) 234-0011, ext. 260. This entry was posted in Uncategorized and tagged Lash, Levinston, Miles for Matheny. Bookmark the permalink.